visit with Marcel & Michaela. water at our lovely site. The creature from Black Lagoon? our 9 day visit was over. Frankfurt, while we caught a northbound Party Bus to Disneyworld in Orlando. visit her friend Mary while I held down the fort. spent the next 5 days horizontal on the couch chewing on muscle relaxants. We were the only folks at Disneyworld I would guess who did not partake of the parks. 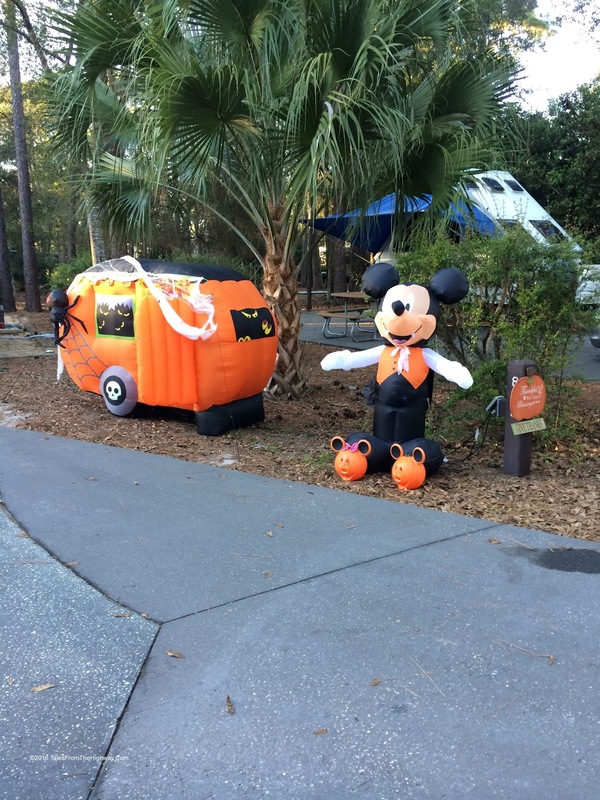 The campground at Disney - Fort Wilderness is very nice. Large well kept sites with full hookups and the price to match. Entry to 800 loop at Fort Wilderness. campsite and some folks were really putting their creative side to work. smoke, a ghost steering the ship etc. a skeleton would pop out. The people next to us had a large Spider that would sense motion and jump out at people. to visit the hotels that surround Bay Lake & the 7 Seas Lagoon. Our first stop was the Wilderness Lodge. feel that you are there. headed to the Contemporary Resort which you can see in the photo below. end after picking up and dropping off passengers. we were about to depart the station. or look outward over the park. The GFH is a huge property with many buildings on its expansive grounds. I cant say for certain but it must be one of the largest at Disneyworld. The hotel has a Victorian theme. The pool with another of the buildings behind. taxi that you can take about the park. our final taxi of the day back to Fort Wilderness. 7 seas lagoon with the natural Bay Lake. It crosses the road here and overhead, unseen in this photo the monorail also goes by. Its an interesting feeling crossing over busses in a boat. Back at the bus the two doodles held down the fort. and you can see how they lay there just hoping that some would find its way to them. On Friday morning we left Ft Wilderness and headed north. Saturday morning we made the final 400 mile trip Home. 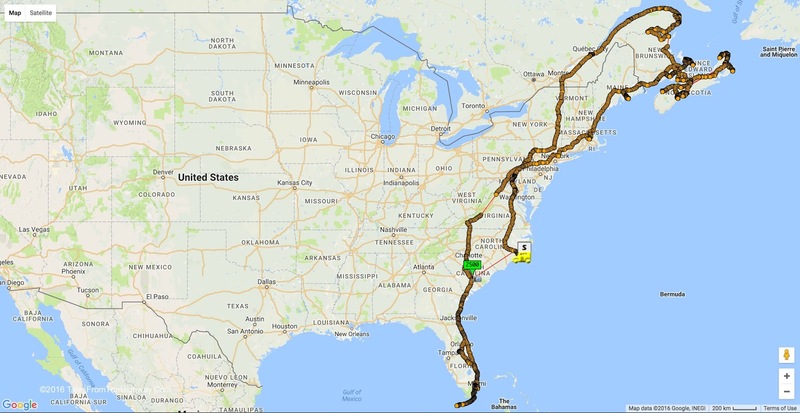 The map below shows our travels the last 9 weeks. and tons of great memories. Now we are not sure what this winter will bring. Right now it looks like we will stay parked for 6 months till May. Maybe a short winter reprieve to Florida? the Yukon and Alaska for next summer. In the interim - safe travels everyone. and we were roaring south along the same coast. First - our home is fine. Second - so are we. on I-95 to South Fla.
that they were evacuating inland and the RV Park was closed. No problem... all part of the Journey. a bit more formal about trying to get that info included. 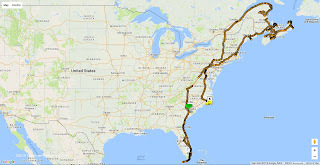 Here is a synopsis of our other stops on the way south. Exit 269 On I-81 Mt Jackson, Va.
A nice overnight stop, we had a long pull thru with FHU and stable 50amp. Campground Reviews gives it a 7.8 and for an overnight stop - I'd say that is fair. As a destination stop I'd give it a 6.9 or 7. We only hooked up electric and had good Verizon signal. unfortunately it was not running when we passed thru. The Fort Chiswell RV Park. Our next stop was just 180mi south in Ft Chiswell, Va.
Those of you who travel the Blue Ridge area might recall the town. the campground is conveniently located for either interstate. FHU and stable 50amp. Pull thru long enough to stay hooked up. Campsite Reviews gives it an 8.3 and I just dont get that one at all. As an overnight park I'd give it perhaps 7.4. Certainly fine for an overnight stop and very convenient. We finally hooked up here to drain tanks and refill water as its been a week or so. had evacuated due to Matthew and was closed. A nice park behind a large fleamarket - again for me not a destination park but fine for overnight. My site was not long enough to stay hooked up. FHU and 50amp. Good Verizon signal. We only hooked up electric. Some spots in the park were a bit tight for maneuvering but not a big deal. I'd rate it about the same at Ft Chiswell. RV Park reviews says 7.5 which is fair in the overnight category. We've been here before. A very nice park. Long Pull-thrus and back in sites. FHU 50amp solid Verizon signal. RV Park Reviews gives them 9.3 I'd give it about 8.5 which is still good. It is definitely a destination park with lots of snowbirds in winter. and then I-95 south from there. Along the way damage from the storm was evident everywhere. Trees down had been cut and cleared. At one point low hanging branches actually scraped the roof of the Bus as we passed by. Our initial Florida destination was CB Smith Park in Broward County. in order to first spend time with them in the Miami area. CB Smith is a county park in Pembroke pines. FHU with 50amp and decent sized spaces and spacing. And it comes with a herd of Iguanas. The little critters were changing color and running all over the place. We surprised Marcel & Michaela at the airport. Soon they were visiting us at the park and taking the Doodles for a stroll. A view back towards our bus. We braved the traffic to visit M&M over at their hotel in Miami Beach. The Miami traffic is horrendous but the view from the hotel was wonderful. A self portrait on the balcony. We had a wonderful Sunday morning brunch on the patio outside the hotel. An amazing assortment of foods was enjoyed in this beautiful tropical oceanside setting. After several days in Miami we headed 150 miles south to the keys. Traveling over the 7 mile bridge. Ok... one more park review. This place is beautiful. Beautiful Landscaping with FHU and Cable. All the sites are privately owned and leased at the owners discretion. Each site therefore is individual in nature with different landscaping and amenities. In between the roads is a nice park with picnic area. This was taken right by our site. This is the view standing next to the door of the bus. block wind or rain if needed. It also had a sink and refrigerator. or is she hunting for fish? We took some nice swims right from the dock. Bluewater is truly a great park. It is like Las Vegas Motorcoach Resort on a tropical island. Into Key West to see the sights. Below is the Customs House. A cruise ship was in town so we had several thousand extra people running about. Fortunatley it made a 130 departure. all at once headed back to the ship. We stopped and spent a little time at Smathers Beach on the south shore of Key West. "why do they cross the road?" Tonight we again said goodbye to Marcel & Michaela. they head to MIA to board a Lufthansa A380 to Frankfurt. "The end is always the beginning of the next adventure." officially concluded our whirlwind tour of the Canadian Maritimes. We left on a crisp fall day with the trees showing more and more color as the days pass. Our stop for 2 nights was Rockwood Park in Saint John. city in New Brunswick and second largest (behind Halifax) in the Maritimes. but it was sparsely populated and quiet. and the Bay of Fundy beyond the harbor. These campsites would have the view - but also the noise from below. We were tucked behind the hill and it was nice and peaceful. hooked up. This view of the deer across from us give an idea of the environment. Saint John City Market - the oldest continuously operated farmers market in Canada. The market moved to its current building in 1876.
to wait for another day. We crossed the border back into the US at Calais, Me. to keep most of it. Our next stop was 4 days in Bar Harbor. We stayed at the Oceanside KOA on an electric/water site. of a week or do of travel and no hookup. We had a pretty decent view from the bus. I think after all the gorgeous places that we've been we are getting pretty fussy about the views. and grab some lunch in Bar Harbor. There were 2 cruise ships in Bar Harbor the day of our visit. 2 ships per day in town each day so no day was going to be better as far as crowds. by John D Rockefeller, Jr between 1913 and 1930.
other monuments celebrating their wealth and power. Today the roads are preserved for Hikers, Bikers, and Horses. Unfortunately I was unable to break away from work to spend time on them. seats when several thousand cruise passengers have arrived to look at the pretty colors. hardwoods and this year seems to be mind-blowing as far as the colors. but I do not remember ever seeing such vibrant colors as we did during this stretch. to Normandy Farms RV Resort. Just an overnight stop for us so I reserved a long pull thru where I did not need to unhook. Full hookups and 50amps seems to be most of the sites. The place is huge and quite nice. where the word "Resort" in the name is deserved. Every imaginable activity is here. Baseball fields, Basketball, Tennis, 2 outdoor and 1 indoor pool etc etc. 2 of the 3 Pools. I took this from the Shuffleboard Court. Our bus is hiding between the trees top right center. We left Foxboro at 0630 headed to the Shenandoah Valley Virginia. A 540 mile day took us thru Mass, CT, NY, NY, PA, MD, WVA, and finally into VA.
8 States and 9 hrs later we are in Quicksburg, Va for an overnight stay. Today is a short 3 hrs to Wytheville, VA for an overnight. We have reached the outer rain bands from Hurricane Matthew. but I expect we will get wetter as we head south towards Fla.
and we are keeping an eye on the weather as we move about.